On this episode of The Angry Millennial, we're chatting with commercial landscape + portrait photographer, David J Crewe. David is a career journeyman with stints in movie production, IT, working as a QA Engineer, a business development manager for Phlearn, before finally going full-time with photography and becoming a Manfrotto Ambassador along with creating educational content for Photofocus + Resource Magazine. We chat about how we finally properly met + hung out at WPPI, being yet another Canadian we know through the show like Renee Robyn, what is was like working for Phlearn so early on, how a series of his inspired and episode of Warehouse 13 on SyFy and more on this episode of The Angry Millennial. BorrowLenses's mission is to advance the photographic and cinematic dreams of their customers by delivering superior, cutting-edge gear and providing exceptional customer service. Rent, shoot, return - it's as easy as that. You choose what you want, when you want to receive it, and for how long you want to rent it for. They ship the gear directly to you, or to one of their many convenient pick-up locations. On this episode of The Angry Millennial, we're chatting with PhotoshopCAFE Founder and aerial photographer, Colin Smith. Colin is a Photoshop guru starting out as a graphic designer to aerial photographer + author of over 19 books. Colin is a regular columnist for Photoshop User Magazine. He's been featured as a speaker at major industry events including WPPI, Siggraph, PMAI and Flash Forward. We chat about how we met randomly in line at WPPI, being part of WPPI so early on during Skip Cohen's tenure, his early teaching days with teaching photographers how to transition from film to digital, his early start as in with Voice magazine, being a CreativeLive alumni from the very early days, and more on this episode of The Angry Millennial. On this episode of The Angry Millennial, we're chatting about my upcoming trip to LA July 14-19th, amazing guests this week, and the last Wednesday episode for a while coming next week. Jessica co-hosts this episode where we chat about the big LA trip next month to do some consulting + recordings, wanting some feedback on Creatives Aga;nst Depression, how awesome it was being illustrator Timothy Giuliani's first interview, simultaneously vomiting + shitting horse designs (blame Tim for that one), my quest for a sushi burrito while out in LA with Oliver as my foodie Sherpa guide, and an awesome BorrowLenses giveaway coming up and more. On this episode of The Angry Millennial, we're chatting with photographer and YouTuber, Nathaniel Dodson. Nathaniel is a Philadelphia based photographer & creator of the Tutvid YouTube channel that's been a staple on the platform for the last decade. We chat about his growing up as one of 8 kids, who on long family road-trips got to play with the family 2MP digital camera, getting his first taste of photography. We talk about going trading stocks when he was 12 years old, to selling paintball guns, to finding his true calling. However, it was his love of Photoshop that took over as he launched the Tutvid channel on YouTube in 2006. Years later, Nathaniel decided to get into wedding + portrait photography, a random convention where Dodson was teaching both a Photoshop class + lighting class ended up putting him on the map. Nathaniel talks about how important it was for him to take the time to really learn his craft allowing his YouTube channel + other companies cover his bills. Digital Transitions is the largest provider of high-end digital solutions in the United States. They specialize in the sales, rentals, training and support of both new and used digital backs from Phase One and Mamiya Leaf. They continually research and invest in resources that allow them to meet the many demands of their clients. They work behind the scenes to make sure you are working efficiently so you get the most out of your Medium Format investment. Click the above image to see how you could join the Digital Transitions team as the new Head of Design, Web + Social Media as well as see the MANY discounts Digital Transitions is giving away to AM listeners! On this episode of The Angry Millennial, we're chatting with author and mentor's mentor, Ken Rabow. Today's episode is a bit longer than usual so get comfortable as we'll be talking about Ken's career and towards the end we'll even be doing a live meditation walk-through. Ken Rabow has lived quite a storied career with various positions in music, adolescent development, holistic healing, and teaching music as a music director, Reiki healer, cantor, professional jazz drummer, + author of The Slacker's Guide to Success. We chat about starting his early successes in drumming, turning pro at 17 playing all around Canada at jazz clubs six nights a week. Early on just when Rabow was finding his stride teaching others, he came into contact with his drummer mentor that he'd serve under for years. As Ken went along through out his career he started working with kids as a music director, then later as a life empowerment coach for troubled teens which he continues to this day. On this episode of The Angry Millennial, we're chatting about the end of another school year, Summer break, and vulnerabilities. Jessica co-hosts this episode where we chat about dressing your kids to impress on a budget (thanks Amazon), elementary school graduation, a rough week dealing with failure, my Upworthy cover letter, how watching Daredevil inspired me to write with my eyes closed, some really awesome BorrowLenses giveaway coming up and more. On this episode of The Angry Millennial, we're chatting with commercial portrait photographer, Dan McClanahan. Dan McClanahan is a commercial photographer based in Iowa of McClanahan Studio run by Dan himself + his wife, Alex. Having the awareness of investing in their future, they forewent getting a house early on to save and launch the studio, then investing in a building to set themselves up for a while. We chat about starting his studio right after the recession hit in '08, getting his first big break shooting his alma mater Iowa State learning on the job, and how important patience plays in your creative career. Recently, Dan won the Chimera Visionary Contest and been having some success with print competitions as well. On top of all this, the biggest development was having their first child, a beautiful baby girl whom Dan calls his new muse. On this episode of The Angry Millennial, we're chatting with Nikon Ambassador, speaker, + commercial fashion photographer, Dixie Dixon. Dixie Dixon is quite an amazing testament to how hard work, shooting all the time, and networking can catapult your career like hers has in just six short years. After winning a contest in college to go to WPPI on a scholarship, she met with the Head of Marketing of Nikon, which led to her shooting a camera campaign for them shortly after and later becoming a Nikon Ambassador. We chat about her involvement in the latest Nikon D5 campaign, how studying aboard in London through a Syracuse University program and assisting some of the European greats helped launch her career. Like most AM guests, Dixie has been on CreativeLive for fashion lighting as she grew a following around her style work. We talk about how through a commercial career you quickly realize how to give honest upfront feedback to your team to make sure no one wastes their time and more on this episode of The Angry Millennial. On this episode of The Angry Millennial, we chat about the NG Summit this past weekend, and some fun coming up with partner sponsorship, BorrowLenses. Jessica helps co-host this episode where we chat about meeting so many amazing young entrepreneurs at the NG Summit this past weekend in NYC. We got to listen to some amazing entrepreneurs and inventors speak about their journey, their companies, and the work they put in to make it onto lists like Forbes 30 Under 30 + shows like Shark Tank, with some notable people like Kim Kaupe of ZinePak, Gerard Adams of ELITE DAILY + Fownders, Kai Kloepfer of AE Gen Technologies, John Meyer of Fresco News, Harry Paul, Benjamin Stern of NOHBO Ball and many more. We also shed some light on the upcoming BorrowLenses promotions which will be announced at the end of the month with more details to come and more on this episode of The Angry Millennial. On this episode of The Angry Millennial, we're chatting with restaurant branding guru, Vigor & Grits + Grids founder, Joseph Szala. In this episode, we chat about his feelings when his alma mater is no longer around anymore, relocating to Atlanta which spurred the idea behind Grits + Grids, having his first big client be a restaurant out of Hawaii, GRYLT, instead of a local joint, writing two books about restaurant branding + email marketing, making shirts with hilariously horrible restaurant names, his real beef with Yelp, later in life teaching at the college where he graduated, the funny coincidence about knowing upcoming guest Jason Donnelly and more on this episode of The Angry Millennial. 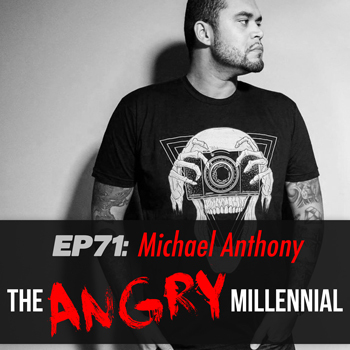 On this episode of The Angry Millennial, we're chatting with photographer + ClickGear founder, Michael Anthony. In this episode, we chat about learning photography at a young age and wasting grandma's Polaroid film, moving to NYC the day after high school graduation, his vision for the ClickGear brand, the importance of goal-setting and having aspirations, going to Seattle for CreativeLive + getting to meet past guests Chase and Kenna, being a photographer in a smaller market and no longer feeling like creatives have to be in big markets like NYC or LA with technology and social media, struggling in a previous job in insurance dealing with having to deny people coverage who really needed it that led to bouts with depression and drinking and more on this episode of The Angry Millennial. On this episode of The Angry Millennial, we're doing something a little bit differently than usual. Recently we've sat with John Lee Dumas, host of the wildly successful daily podcast, Entrepreneur on Fire, EOFire. Since it was a short 25 minute interview, we decided to just drop it in on a Wednesday episode and Jessica + I will be back next week. In this episode, we chat about growing up in Maine before moving on to warmer climates, how his time deployed in the military helped re-frame his perspective on life, how transitioning into residential real estate helped give him a taste of what entrepreneurship was like, making sure he had a 1.5 year runway to start going 100% with EOFire, the amazing support system of having Kate in his life, what it was like having Tony Robbins himself on his show, his worst interview with a guest reading off a paper, asking tough questions about his critics who think he gives enough free content to hook people into an expensive program, being a CreativeLive alumni and more on this episode of The Angry Millennial. On this episode of The Angry Millennial, we're chatting with lifestyle entrepreneur + CreativeLive's Profit. Power. Pursuit podcast host, Tara Gentile. In this episode, we chat about her Quiet Power Strategy on selling yourself without selling yourself, struggling with the inevitable imposter syndrome, agreeing with Gary Vaynerchuk's jab, jab, jab, right hook mentality but argues throwing more right hooks early on can set the tone for how you run your business, the fear of letting down employees that now are under her entrepreneurial umbrella, what it was like saying no to CreativeLive for a craft class in hopes they'd bring her on for something else building that relationship into 6 courses on the platform and even a 30-day bootcamp How To Build a Standout Business, how no one ever talks about positioning in regards to marketing your business, our decision to change the weekly format to a 3-day a week show, the importance of paying attention a lot, her girlcrush on Tina Fey, and more on this episode of The Angry Millennial. On this episode of The Angry Millennial, we're chatting with renowned photographer, APA National EVP Emeritus + Chair of the APA Advocacy Committee, Michael Grecco. In this episode, we chat about how he came on our radar with Ron Jautz during our recording with him, his awesome work with the APA to help lead the charge for copyright reform, his photojournalism work early on at the Boston Herald then moving onto People Magazine, dating someone from the renowned Spotlight team behind the recent critically-acclaimed film by the same name that won the Oscar for Best Picture of The Year, joking 20 years later about their first shoot together and working with Will Smith again for a Sports Illustrated cover on 'Concussion', how to run a timed set for high-profile, big production shoots, learning to become a better listener as a photographer later in his career, relaunching MichaelGrecco.com, writing multiple books over his career, launching ProStorage to relieve hard drive archiving issues many creatives face, and more on this episode of The Angry Millennial. On this episode of The Angry Millennial, we chat about Google Play, metal desks, and some fun coming up with partner sponsorship, BorrowLenses. Jessica helps co-host this episode where we chat about the show being up on Google Play, our beef with iPhones, finally going out to dinner with #1 show supporter, Don and his wife, trying to find Mr. Robot since cutting the cord, creepy voicemails on my home answering machine, how paying $24.99 for something nowadays is a tall ask, the joys of helping coach Little League baseball, upcoming BorrowLenses promotions on the show and more on this episode of The Angry Millennial. 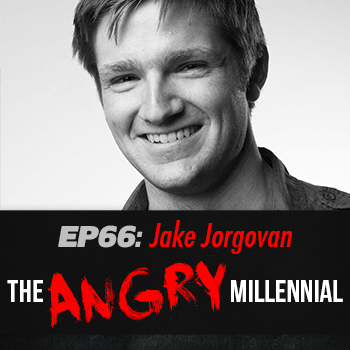 On this episode of The Angry Millennial, we're chatting with founder of Outbound Creative + host of the Working Without Pants Podcast, Jake Jorgovan. In this episode, we chat about what it was like co-founding a business at 19 years old, learning real-world pains about naivete, involving emotion in business, finding the right fit with regards to your skills, and being honest with yourself. Starting out with a service business as opposed to a product business is a completely different animal, which Jake learned early on. With Outbound Creative, Jorgovan helps agencies attract the sort of customer they want to work with, and we chat about his vision for the Working Without Pants Podcast, and more on this episode of The Angry Millennial. On this episode of The Angry Millennial, we're chatting with cinematographer, Andreas Von Scheele. In this episode, we chat about the huge shift within the film making industry with the advancement of DSLR video technology, working with companies like Chimera + Canon, speaking at NAB with Canon for 'Indie Filmmaking' Panel, working on personal projects + documentaries like Wakaliwood + Running America '08, the profound work he does with Angelight helping sick kids make their own films, the importance of constantly making yourself uncomfortable with your work + career to fight being forced into a box, and more on this episode of The Angry Millennial. On this episode of The Angry Millennial, we chat about the new weekly format, big guests coming up, and how Jess is the Goose to my Maverick. Jessica helps co-host this episode where we chat about having John Lee Dumas (JLD) of EOFIre today, the 30th Anniversary of Top Gun - the best fighter jet movie of ALL time, Jessica starting 30 Days of Yoga with Adriene, having dinner with our #1 listener from Day 1 DONNIEEEE who found us through Corwin's episode, seeing what merch we're going to make for you guys (let us know by the way - I vote stickers + more tees), some Game of Thrones news (Hellooooo Khaleesi! ), and more on this episode of The Angry Millennial. On this episode of The Angry Millennial, we're chatting with branding Jedi, head of DBD International + Fast Company contributor, David Brier. In this episode, we chat about the horrible idea at most companies of 'design by committee', the definition of branding in less than :40 seconds, how he started his career early on landing big clients, how no dates on his blog help serve his audience with all evergreen content, working with Legacy chocolates as a client and chocolate lover, the amazing genius behind James Corden's Carpool Karaoke along with an awesome interview with him on Marc Maron's WTF podcast, seeing longevity in Medium as a platform, the branding challenge of having a gourmet Kosher food client, and more on this episode of The Angry Millennial. On this episode of The Angry Millennial, we're chatting with commercial/fashion photographer, Wesley Carter. In this episode, we chat about growing up with a single mother who provided + introduced Wesley to coding at 12 years old in 6th grade, reading the article Shining Light on Depression: An Often Dismissed Struggle Any Creative Can Face and feeling comfortable opening up on a random phone call about his bouts with depression + bi-polar tendencies, social media and the arts, going to Drexel University for engineering at 16 and dropping out for financial reasons, working towards things without putting a deadline on them to help keep momentum, striving to constantly learn from his mistakes and just be happy, and more on this episode of The Angry Millennial.